constituency: a district or riding represented by an elected member of a legislative body.constituency in the country. These are the people who vote on legislation presented by the government. 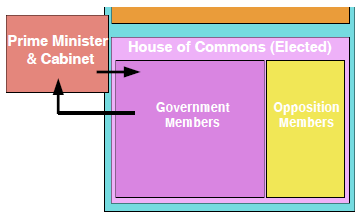 The House of Commons has two banks of desks which face each other. One side is for the government, that is, the party which has the most seats. The Prime Minister and the Cabinet sit in the front rows. On the other side is a section for the Official Opposition and a section for members from all other opposition parties. The Official Opposition is the party which came second in the election and it has a greater responsibility to challenge the government. At the head of the hall sits the Speaker and in the middle are the Hansard reporters who record the day's speeches word for word, and the Sargeant-at-Arms who provides symbolic security and officially opens the day by laying the Mace - a gold-plated war club - on a table in front of the Speaker. 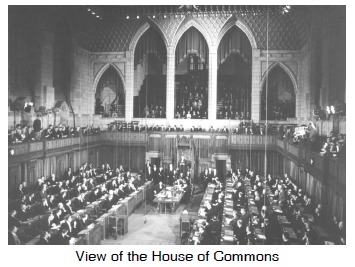 The House of Commons is where proposed laws are introduced. They are called "bills" at this stage. The bills are discussed and eventually voted on as part of the seven-stage process of a bill becoming law. Another important part of the House's daily activities is Question Period, a 45-minute period every day when opposition members can question the government about its policies and actions. This is often quite lively.